Maintaining Oral hygiene is crucial to keep your teeth to be in pristine health. However, despite regular brushing and flossing, areas may be left where food particles may invite bacteria to grow to form a layer of plaque. With time, this layer of plaque gets calcified forming calculus. This causes gums to inflame and pain. When you face such issues, you need the help of an expert dentist of teeth scaling in Lahore. 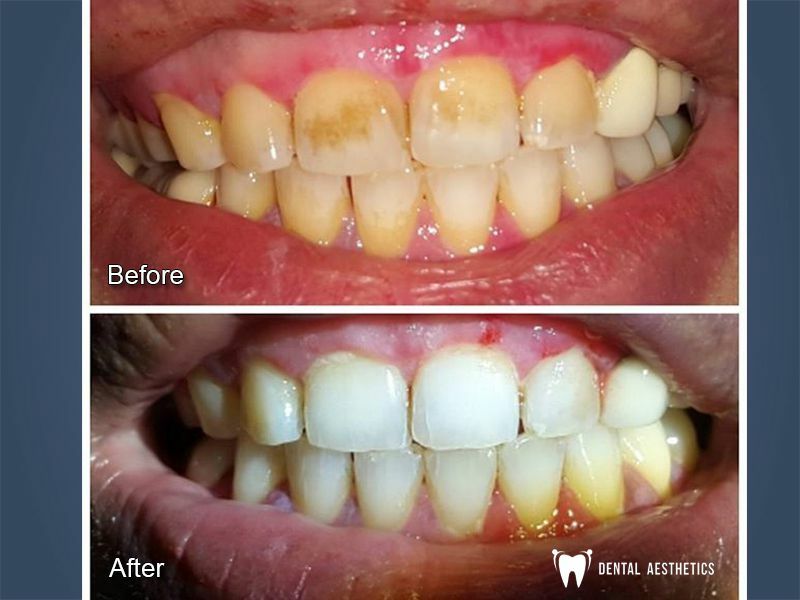 Dental Aesthetics treats patients with such conditions and providing various deep cleaning methods. Our specialist recommends Teeth scaling once in 6 months or at least once a year. Teeth cleaning performed by an expert dentist at Dental Aesthetics allows thorough cleaning of the teeth and gums. Such teeth scaling in Lahore also reaches the root surfaces beneath the gum line. It is considered one of the most effective methods to treat gum related diseases. In most cases, the method does not involve any surgical procedure. Our teeth scaling experts in Lahore may suggest the patients use antibiotics after a particular diagnosis. The use of such a treatment method helps eliminate harmful bacteria and their hazardous toxins. Get in touch with Dental Aesthetics to ensure that you get the best treatment for teeth cleaning in Lahore. When you choose Dental Aesthetics, you can avail the full range of surgical and non-surgical treatment methods. The primary focus in treating patients for teeth cleaning in Pakistan is targeted at disrupting the biofilms of bacterial plaque. The treatment method, with the help of latest equipment, ensures thorough cleaning of the teeth surfaces and gums. Emergencies may arise due to different reasons including tender or swollen gums, bleeding during brushing, sore gums, etc. If you have to deal with any of these painful situations, please get in touch with a dentist at Dental Aesthetics. We are fully equipped to take care of all such kinds of emergency situations with ease and professional expertise. When you plan to go for teeth cleaning, you need to understand that the dentist has to have an examination. You also have to be careful to consult with a dentist who understands the risks associated with teeth cleaning. For example, to avoid the accumulation of harmful bacteria below the gum line. Also, after getting teeth scaling treatment, you should abstain from smoking for a few days, if you are a smoker. There is a difference between deep cleaning and root cleaning. When you undergo root cleaning, it removes the hard deposit from root surfaces. Once a patient undergoes dental x-ray and gum charting, they are able to know the difference. The signs of problems include swollen or inflamed gums and deep pockets. We strongly believe in offering services that are affordable for our patients. There is no single way to determine the cost of root planning in Lahore. However, the costs depend on the amount of tartar and plaque present. Dental scaling becomes necessary when there is a plaque on root surfaces. Our expert dentist will examine your smile to determine and share an accurate cost estimate. The dentist administers local anesthesia to reduce patient discomfort. Then, once the affected area is numbed, the dentist uses an ultrasonic cleaner or scalar to clean below your gum line for removing the tartar and plaque. Once the procedure is completed, the root surfaces are smoothed. In most cases, it helps the gums reattach with the tooth structure. The dentist may choose to take additional measures if the periodontal pockets remain after dental scaling and root planning.